"On November 20, 2006, the Court entered an interim order approving debtor-in-possession financing in the amount of $350,000 from Bear Sterns Investment Products, Inc. ("Bear Sterns"). The interim order authorizes use of the $350,000 in conjunction with an approved budget which is designed to meet some of the Debtors' emergent needs, including, among other things, insurance, security for the developments and payroll. " But Did Prices Really Rise? New Home sales were out today. Although the number of sales were lower, prices actually rose. I don't actually think prices rose, rather, people buying new homes got more for their money in the form of incentives. If you look at the third quarter results of the homebuilders, you will see that gross margins tightened pretty considerably from the third quarter of 2005 to the third quarter of 2006. In the case of Lennar Homes, the gross margin fell from 16% last year to 8.7% this year. In short, Lennar added larger kitchens, granite countertops and mortgage paydowns to in order to induce buyers to make a house purchase. The extra incentives show up in Lennar's financial statements as an increase in Cost of Goods Sold, or as a decrease in gross profits as a percent of revenue. "Nov 29, 2006 — WASHINGTON (Reuters) - Sales of new U.S. homes dipped in October and inventories rose, but builders boosted prices by over $30,000 per unit after a sharp decline in home prices a month earlier, a government report showed Wednesday. New single-family home sales declined 3.2 percent in October to an annualized rate of 1.004 million units from a downwardly revised rate of 1.037 million in September, the Commerce Department said. Analysts polled by Reuters were expecting October sales to ease to a 1.044 million rate from a rate of 1.075 million in September. October sales were down 25.4 percent compared to a year ago. The median sales price of a new home rose more than 13 percent to $248,500 in October from $218,200 in September as builders were able to boost prices despite a modest decline in the rate of sales. October's median home price was the highest since they reached $257,000 in April." Last week 4378. At the same time last year, there were 3065 homes for sale on the MLS for Eastern Monmouth County. "Obtaining a precise read on home prices is difficult: During a period of weak demand, potential sellers often choose to leave their homes on the market longer or even to remove them from the market, rather than accept price offers that are below their expectations. The timeliest data on house prices do not fully account for changes in the composition of home sales by location, size, and other characteristics. Moreover, the data do not capture hidden price cuts, as when builders try to stimulate sales through the use of "sweeteners" such as paying the customer's mortgage points or upgrading features of the house at no additional cost. Nevertheless, there can be little doubt that the rate of home-price appreciation has slowed significantly for the nation as whole. Some areas have continued to experience gains--albeit smaller ones than before--while other markets have seen outright price declines." "Sales of existing homes posted a tiny increase in October but the median home price fell by a record amount. Analysts forecast more price declines in coming months as the once-booming housing market undergoes a painful correction." New home sales will be reported tomorrow. Johnathan Miller at the Matrix linked to this article last week. The article basically describes the NAR's excuse for why real estate brokers rank last on a poll of most prestigous occupations. "Recently, some journalists reported results of a Harris poll in which real estate agents were perceived as one of the least prestigious occupations in a list of 23 professions. Too bad they didn’t include Realtors® on the list. Realtors® are distinct from real estate licensees. In addition to completing mandatory quadrennial Code of Ethics training, Realtors® also have access to educational opportunities and training in real estate specialties that are not available to other licensees. NAR’s Public Awareness Campaign educates consumers about these and other distinctions, and after nine years, the campaign’s effects are evident. "Anyone who has had trouble selling their house in recent months, trying to decide whether to drop the price or take the house off the market, may have been surprised to read that third-quarter median housing prices in the region that includes Monmouth and Ocean counties were up 7.3 over the same quarter a year ago. What about the real estate bubble? What about all the unsold inventory? What about all the homes that have been sitting on the market for months without drawing any serious offers? The explanation, it seems, is that the median price was pushed up by the tepid demand for homes in the moderate price range. Demand has remained stronger for high-end real estate." [THE euro climbed above $1.30 on Friday, hitting its highest level since April 2005, with further gains predicted in the months ahead. The dollar fell sharply at the end of last week on fears about the US economy, unsettling financial markets. The dollar’s fall had a knock-on effect on a wide range of markets. The price of crude oil rose in dollar terms as a direct reflection of the American currency’s weakness. US trading was quiet ahead of the weekend as a result of the Thanksgiving Day holiday. The NY Observer takes a look at the myth that big Wall Street bonus seasons leads to increased home purchases. "In 2005, Wall Street investment houses handed out a record $21.5 billion in year-end bonuses, according to the State Comptroller. This year may be even bigger, with I-bankers and other staid dice-rollers expecting at least $36 billion total in bonuses to be doled out this winter. Real-estate brokers must be popping champagne bottles. A very healthy bonus season means a very healthy Manhattan home-sales season in the spring, right? Not really. While bonuses can pump up springtime prices, the effect on the volume of sales is more Wizard of Oz than Master of the Universe." This article reports that the median price of homes in the Shore area grew 7.3% in the third quarter. A few experts offer an explanation for the apparent rise in the median price. Anecdotally, and from keeping track of a few homes, I think house prices on a same-house basis are about 10% lower compared to this time last year. What also needs to be pointed out is that many homebuilders reported record sales in the third quarter of 2006. Although the sales levels might have set new records, the homebuilders gross margins collapsed by between 200 and 500 basis points. This was because although the builders kept list prices at high levels, they also added incentives, such as appliances, mortgage buydowns, and pools, that increased costs. In short, they sold more house for the same amount of money. Given the use of incentives by new home builders, I would not be surprised if the higher median number didn't also include the increased use of incentives, (ie. cash rebates, pre-paid taxes etc.) on existing homes, which unfortunately are not netted out of the gross sales number. After taking a slight dip in the second quarter of 2006, median home sale prices in the region that includes the Shore area rose 7.3 percent in the third quarter, the National Association of Realtors reported Monday. quarter, the median sales price had fallen 0.1 percent to $393,600. The median means that half the homes in the area sold for more and half for less. "It kind of took us to the ground almost,"
The Asbury Park Press has a few Kara related stories today. John Cambra Sr., owner of Air Controlled Environments Inc. in Lacey, was able to pay all his suppliers, subcontractors and other bills, even though Kara Homes owes his company about $120,000. But he had to let his two subcontractors go and lay off four of his eight employees. "It kind of took us to the ground almost," Cambra said. "It was more than half of our business, and, along with that, the slowing economy has really, really thrown us to the ground." A Glut in Manhattan Too..
"A tornado hit the housing sector in October." The pace of new home construction at the Jersey Shore has slowed this year as builders put on the brakes amid turmoil in the overall housing market. The number of building permits issued in Monmouth County through the first nine months of the year fell to 1,103, down 12.9 percent, compared with the same period last year, according to the U.S. Census Bureau. In Ocean County, it fell to 1,503, down 21 percent. "Builders have seen the light from the housing market meltdown and are now moving as rapidly as possible to reduce supply," said Joel Naroff, chief economist at Commerce Bank. "A tornado hit the housing sector in October." "U.S. October Housing Starts Drop 14.6%"
Nov. 17 (Bloomberg) -- Housing starts in the U.S. tumbled in October to the lowest in more than six years, as waning home sales and swollen inventories discouraged new projects. Builders broke ground on 1.486 million new homes at an annual rate, down 14.6 percent from September's 1.74 million pace, the Commerce Department said today in Washington. Building permits dropped to a 1.535 million pace, a record ninth straight decline and the lowest since December 1997. I can think of at least one builder who didn't start any new construction in October. The amount of the loan is for only $350,000 and will keep the company in business for about two weeks according to this article. The amount is probably about the amount that would have been needed to put a deposit on one of Kara's Tradewinds Homes. TRENTON — Kara Homes Inc. can receive a $350,000 loan from Bear Stearns to stay in business for two more weeks, a judge ruled Thursday, despite arguments from its major creditors that the investment bank essentially would take control of all of the home builder's decisions. The loan was less than the $2.6 million Kara sought from the investment bank to keep it in business for 13 weeks. But without it, the company wouldn't have met its payroll today and could have shut down. The Otteau Report is published quarterly. It provides charts and graphs showing real estate trends in many NJ towns. This link is to the Monmouth County edition of the Report. "CAPE MAY COURT HOUSE — Tammy Garrison nearly lost her childhood home to a sheriff's sale Wednesday, but a postponement gave her a month's reprieve. The lender foreclosed on this Lower Township home last fall. Garrison said her mother suffered a disabling injury and could not work. “My father built this house. I grew up here. It is extremely important to me,” she said. She hopes she can save the home by taking over the mortgage. In the meantime, the auction has been rescheduled for December." Last week there were 4514 homes listed. Inventories have been dropping pretty steadily the past few weeks, but as I've said in past, I think the drop mostly reflects increased de-listings ahead of the holidays rather than an major increase in sales. I think that prices peaked at the Jersey Shore sometime in the late summer of 2005. At this point, I would guesstimate that we at about month 14 in an approximately 48 month downward cycle. In the coming 3 to 6 months, there will probably be a lull in the amount of attention real estate gets from the mainstream media and some will mis-interpert the lull for an end to the burtsting of bubble. We are likely to see the proverbial "dead cat bounce" in some markets, though not necessarily here at the Shore. The Spring will probably bring renewed interest in the bubble. That's when I expect to see the "gap down" in prices. Some of the Spring 2006 opportunistic sellers are going to be the Spring 2007 forced sellers and they are going to have to take what they can get on price. Unlike over the past few months, forced sellers are going to be hitting low-ball bids. Someone started a blog that compiles information related to the Kara Homes' bankruptcy. Here is the address www.karahomescreditors.blogspot.com. 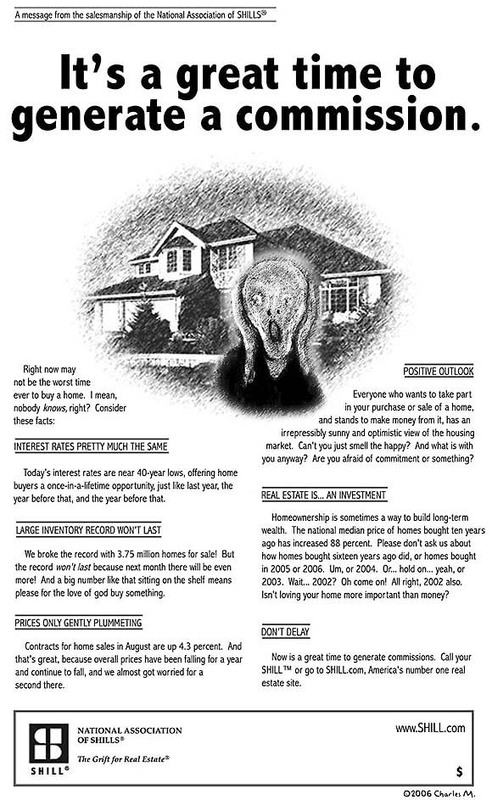 The NAR has a new ad campaign to try to get people to either buy or sell their house. This San Francisco Chronicle has a link to a parody of the NAR advertisement. [Last week, when I received an e-mail press release from the National Association of Realtors previewing its $40 million ad campaign with the slogan, "It's a great time to buy or sell a home," I had to read it twice. This article is almost irrelevant in the face of the Kara Home's bankruptcy. [Not only can homebuyers remain confident about purchasing a newly constructed home, in fact, it's a buyer's market. Prices are lower, interest rates are favorable and holding, and builders are more competitive. Last week we were at 4558. I managed to swing by a few open houses in Monmouth County over the weekend. I met a number of Realtors. None of the Realtors I met were very enthusiastic about the state of the market, and speaking with at least two of them was actually kind of depressing. From their tone and description of the market, they obviously are not collecting any commissions and were trying to get out of the business. For every two Realtors that I might have some sympathy for, there seems to be at least one Realtor who deserves some of the misery not having a steady paycheck entails. One Realtor asked me my housing preferences and I told him very specifically that I had more than just preferences; instead, I had ironclad requirements with no room for deviation. After describing my specific requirements, which included a hard and fast price range and a specific area of a specific town, the Realtor told me about a house that I might be interested in that was 1. Not in my price range and 2. Not in the area I was looking in. I don’t think the Realtor was being intentionally unhelpful; rather, wasting my time was indicative of inexperience. As far as prices are concerned, one Realtor said that his firm believes prices are down about 9% from summer of 2005 on a same-house sale basis. This is what I figured to, though I think some houses in some towns might be down 15% in some areas of the Shore. At another open house I went to, they were having a “one day only” sale. Apparently the asking price for one day was reduced about 5% off of the list price. It was still too high though. Kara Home, Fallen Star etc. The Asbury Park Press has another Kara Homes article today. Karagjozi wasn't able to secure loans with more favorable interest rates, possibly because he had too much debt and was too highly leveraged on his projects. Bristol's client, for example, provided a $5 million loan with an interest rate of 12.5 percent, or 17 percent if Kara defaulted. Karagjozi sold several houses to investors and leased them back, agreeing to pay investors' monthly mortgages. The transaction gave Kara a quick infusion of cash. And it would have paid off if investors turned around and sold their homes at a profit. But when sales slowed, Kara had an extra expense on its books. Karagjozi used its profits to buy more land, hire more people and borrow more money to build even more homes. Once sales slowed, he was undercapitalized. He didn't have enough money to carry him through the downturn." We haven't run a "Post Observations Here" thread since the summer so I think we are due for some input from our readers. If you see or hear anything interesting at open houses or from neighbors or just driving around, post your observations on this thread. In the meantime, maybe we could get some insight on a few random questions that have popped up in recent weeks. Item 1. Does anyone have any idea how the Centex project on route 35 in Middletown is progressing? This looks like a big mess and I find it hard to believe Centex did any market studies to see if it was worth putting up those high-density townhomes right next to the highway. Item2. How is LBI looking these days? I go to think that more than a few "investors" are upset their rental cash inflows for the summer aren't covering their debt service cash outflows for the entire year. Item3. Are people seeing more single family rentals more than usual? Especially in non-vacataion type towns. The inability to get even a miniscule amount of DIP financing suggests there is not much to reorganize and try to get the company back on its feet. Now the US Trustee wants to appoint someone who can run the day-to-day operations besides Zuhdi. TRENTON — Nearly a month after troubled Kara Homes filed for bankruptcy, the U.S. Trustee's Office said it wants a judge to remove founder Zuhdi Karagjozi from running the company's day-to-day operations. Instead, it wants U.S. Bankruptcy Court Judge Michael B. Kaplan to appoint a Chapter 11 trustee, someone who would lead the company during the bankruptcy and help Kara Homes — which now has no money — raise funds to continue operations. And here is Grim's Blog. It's got great coverage of the real estate market for North Jersey, which of course, effects Jersey Shore real estate. Between the Dwek and Kara Homes disasters, traffic has been pouring into this blog the past few months. I wouldn't be surprised if people are also visting the Asbury Park Press website more often. You know, the APP is not just three day old Associated Press clippings and Jason's Furniture ads, they actually do some original reporting too, sometimes. That is the sound a Superior Court judge hopes will be repeated 275 within the next six months as a way to sell off the tens of million of dollars in properties owned by embattled real estate mogul Solomon Dwek. Judge Alexander D. Lehrer this afternoon gave approval to a private company to market all of Dwek's properties via the Web. The company, Wick-Sitar of Monmouth County, will build the Web site and posts pictures and detailed summaries for each property. " Last week there were 4622. Given the 5.9% decreases in pending home sales in the Northeast and falling mortgage applications, I'm pretty sure that the weekly reductions in inventory reflect de-listings more than actual sales. 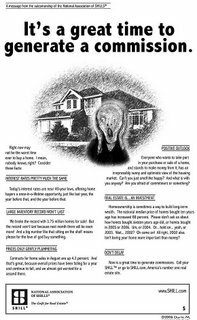 Whether homes are being sold or not, I doubt too many people are anxious to put their home on the market right before the Holidays. It will be interesting to see how much inventory spikes in January, especially since there are over 1500 more homes for sale now compared to roughly the same period last year.